Today, I have the privilege of announcing a milestone I could hardly have imagined when we founded Propeller Health out of a tiny office eight years ago. Propeller will be acquired by ResMed, a leading connected health company that serves millions of people with respiratory disease around the world. 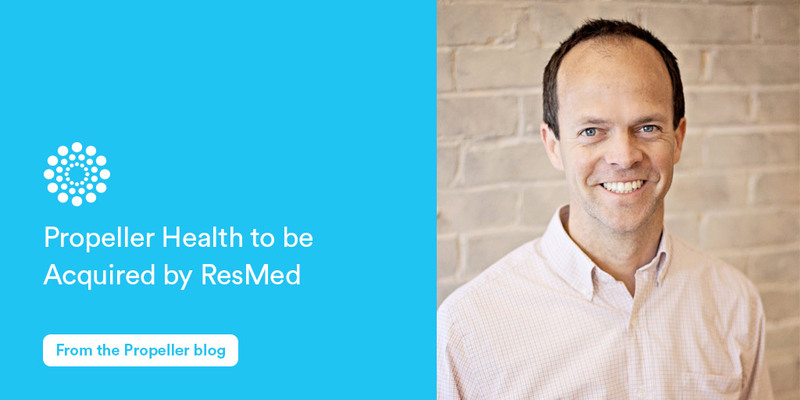 This acquisition, the product of a lot of hard work by our partners at ResMed and my colleagues at Propeller, establishes ResMed as a leader in COPD patient management, across all stages of the disease, and accelerates the adoption of Propeller’s platform for asthma and COPD. I wanted to take a moment to share the email I sent to Propeller’s 90+ employees this morning. We are very excited about the next chapter for our company, and I hope our partners, peers and those following along in the industry will join me in celebrating this moment. A little more than eight years ago, we set out to change the experience of chronic respiratory disease by bringing medicines into the digital era. Today we take a big step forward in advancing that mission: Propeller will be acquired by ResMed, a global leader in connected healthcare solutions. Like Propeller, ResMed is a company that has people with respiratory disease at its heart. They share our belief that connected medicines create vastly better experiences and outcomes for people with chronic respiratory disease, and joining forces establishes both companies as leaders in the category. In the year since we first got to know them, we came to realize a remarkable cultural fit. We also saw extraordinary opportunity for Propeller to have an even greater impact in combination with ResMed: our strong products and partnerships in digital respiratory medicines are complementary to ResMed’s current offerings in sleep and COPD. We’ll be able to make use of the resources that a large organization has to offer, while providing all of you with additional opportunities to grow and contribute. We’ll continue to operate as a standalone company while becoming an important part of ResMed’s respiratory care business. We don’t expect any changes to our team, customers, or day-to-day business processes. It will be business as usual. And we’ll continue getting better at our jobs every day and serving our patients and customers as we normally do. Over the years, more than 150 people have worked at Propeller. I’ll have more to say about the team during our meeting this morning. But, for now, it strikes me that in the beginning, you think startups are about a great idea. It turns out that startups are actually about recruiting great people to bring that idea to life. In the meantime, I can’t thank everyone enough for your contributions to our success so far. You’ve helped build Propeller into a leader in digital health, and I’m excited for the next chapter. We have lots to do to fulfill our mission and, working with ResMed, to accelerate adoption of Propeller at a global scale.